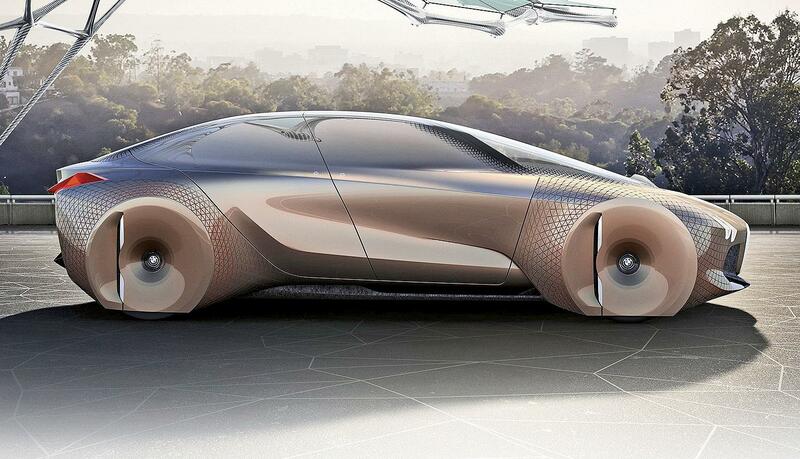 The BMW Vision Next 100 features 800 moving triangles on the exterior and interior that give signals to the driver. MUNICH — BMW AG is celebrating its 100th anniversary with four concept vehicles that will give a glimpse into the future it envisions for all four of its brands — BMW, Mini, Rolls-Royce and Motorrad motorcycles. 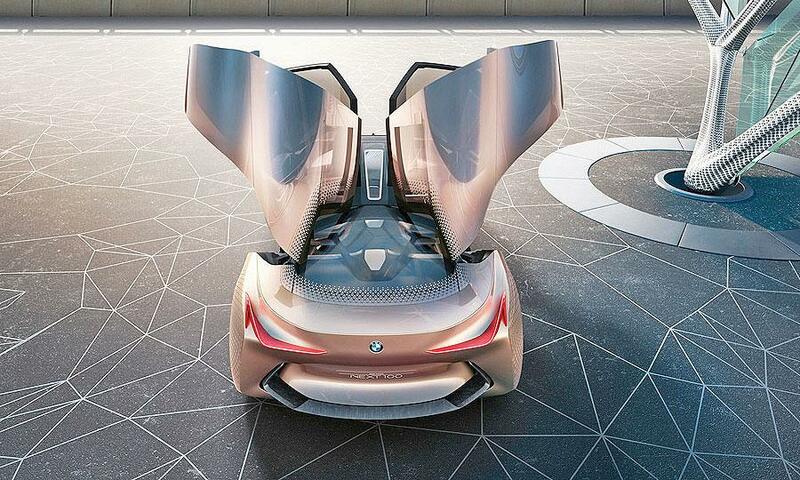 The first was unveiled here last week as the BMW Vision Next 100 coupe, which has advanced driving-safety and navigation systems and can switch into an autonomous driving mode. BMW CEO Harald Krueger said the concepts will display technologies that the automaker will develop in the next 20 to 30 years. But he declined all questions about the strategy he will lay out for BMW, saying details will be presented at the company’s financial press conference here on Wednesday, March 16. The sleek Vision Next 100, with its butterfly doors that open upward, has two modes. One is called Boost, and it assists the driver through semiautonomous technologies, providing an ideal driving line and seeing obstacles ahead. The second is called Ease, which puts the car into an autonomous mode. 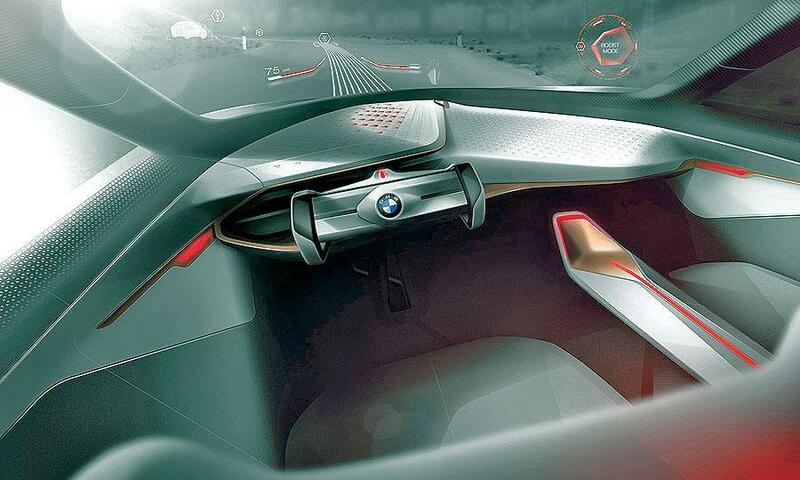 The concept does not have a dashboard, buttons or display screen. Information is transmitted onto the windshield, which serves as a giant head-up display. The driver controls functions by voice or gestures. 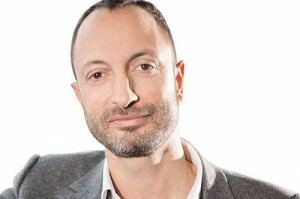 Karim Habib, head of design for the BMW brand, said the semiautonomous mode has been dubbed “The Companion’: “It is the analogy of the co-pilot who is there to help you be a better driver. In the autonomous Ease mode, the steering wheel and center console retract. A light mounted in the front of the exterior alerts pedestrians that the car is autonomously driving. It turns green to indicate it is safe to cross. Video conferences even can be transmitted onto the windshield. The seats are eased into a more comfortable position — similar to couch seating — but do not swivel around, said Habib. “It was important to make the interior uncomplicated,” he said. “You are laid back when you go into Ease mode. Adrian van Hooydonk, senior vice president for BMW Group Design, said the concept is the size of a 5-series sedan but has the interior room of a 7 series. The windows are the same color as the body to increase privacy, he said. The BMW vertical kidney grille does not take in air — it houses sensors, van Hooydonk said. The double round headlamps are minimal. The side, although more modern looking and sculpted, has the typical BMW line that goes from the rear shoulder to the wheel. It has typical BMW short front and rear overhangs and big wheels in the corner. The wheels are covered to prove improve aerodynamics, said Habib. The exterior lighting is different in the Boost and Ease modes, he said. The car has an “Alive Geometry” of 800 moving triangles on the exterior and the interior, said Habib. Inside, they give signals to the driver and “work much in the same way as a flock of birds in controlled flight, their coordinated movements acting as signals that are easily comprehensible to those inside the car,” a BMW statement said. Habib said the body is a composite but did not go into details. Many of the pieces of the car will be able to be manufactured with 3D or even 4D printing in the future, he said. BMW did not say what transmission or drivetrain it used for the concept or when it expects an autonomous vehicle to go into production.